Aimed towards the karting crowd, the basics apply to any car. The Ackerman page compares "Positive Ackerman", and "Zero Ackerman". With Positive Ackerman, the inside wheel turns tighter than the outside. That is the way 99.99% of cars were made. Makes sense, since the inside radius of a turn is tighter than the outside. Reverse Ackerman, AKA Anti-Ackerman, creates the opposite effect, the inside tire turns less than the outside. That is what happens when " rear steer" spindles are mounted backwards. The inside tire wants to go straighter than the outside, so the car will "push" in a turn. 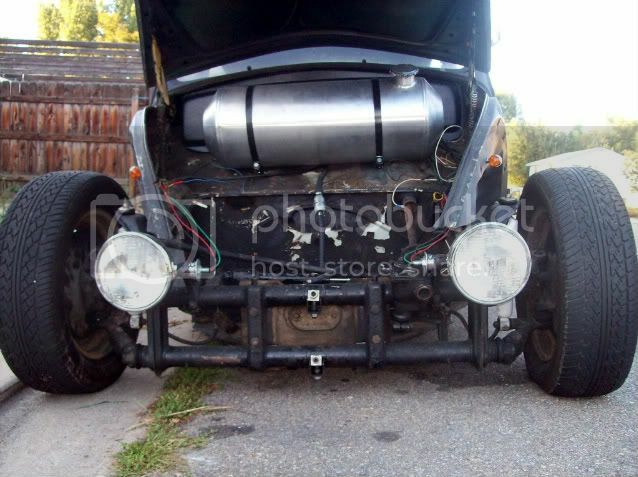 Commonly seen on poorly thought out Rat Rods. Last edited by Unkl Ian; September 25th, 2009 at 08:23 AM. Those are very cool examples of suspension and steering geometry. perfect timing for this post, now i dont have to create one. i was gonna try and align my vrod today, my passenger wheel is toed out about 1 1/2" compared to my nice and straight driver side wheel. Everything was fine and straight, i took it all apart and welded in my adjusters, now the alignment is way off. whats the suggestion for fixing this? i dont believe anything is, but its worth a look. wouldnt be the first thing i was wrong about on this car. What type of adjusters did you weld in? If they are the non-Avis type that require you to cut out a section of the beam then my guess is you cut out too little and that side of the beam is a bit too long. The steering box is always located in a set position for the driver's side so any change in length would show on the passenger side. I'm also assuming you didn't narrow the beam either. It wouldn't take much to be way off at the leading edge of the tire like that. 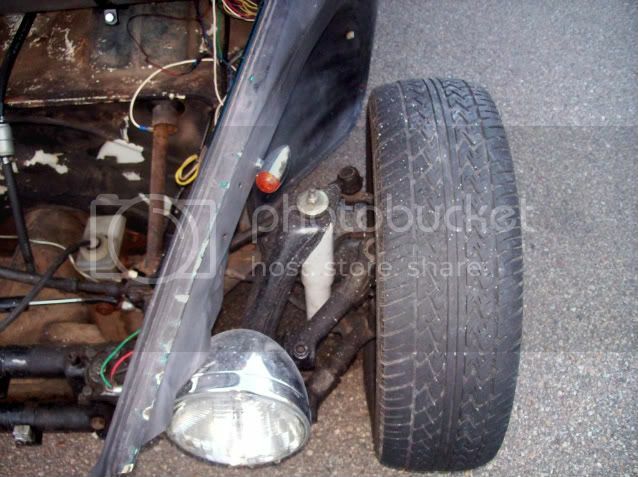 If everything is mounted correctly, just adjust that tie rod and get it back in line. All super good points PJLO!!! Lemme also chime in I suggest that the measurement is inaccurate. Perhaps it is not as far out as we think. Maybe it just needs to be more carefully measured. Good point Fish! And thanks for the link Unkl!! it was the cut and weld sway a ways i think there called, the measurements were done very carefully, but i think something may have gotten out of wack during dissasembly of the beam. and i never adjusted the tie rods after i put it all back, thats still something i'm reading over as we speak and getting the details so i do it right. and i know that cant be good. Last edited by Volksrod19666; September 25th, 2009 at 04:18 PM. 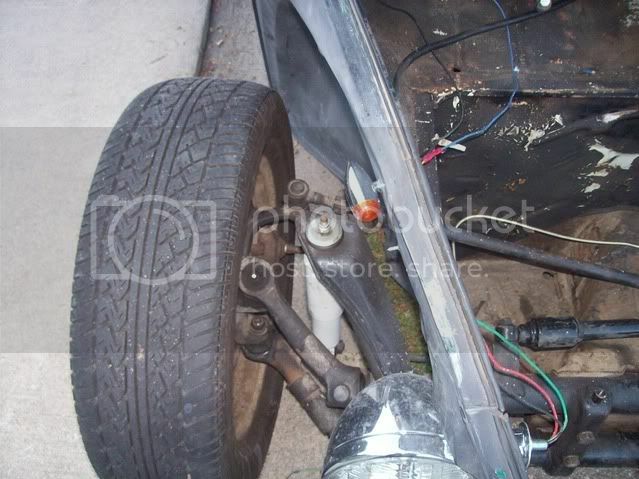 ok so here we go, first we have straight on lookin at it, then one of the driver side compared to the passenger side. hope those help out, i'm pretty sure adjusting the tire rod should pull it in, and yes i know i need ball joints all the way around, maybe in a paycheck or 2, right now i'm tapped out. in order to adjust the tie rod, do i have to pop it loose from the spindle and turn the threaded rod end, or pop it off the steering box and turn that piece? sorry to throw a dumbass question like that out there, but its the one thing i cant get any exact clarity on. and i would prefer to do this right with the least possible ouch, fucks, damnits and other such things. 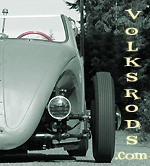 Last edited by Volksrod19666; September 25th, 2009 at 04:32 PM. You don't pop either end off. The tierods ends have opposite threads, so turn one way and both ends screw out (longer), turn the other way and both ends screw in (shorter). Just loosen the collars or lock nuts that hold the tierods tight and turn the rod, may require a big pair of channel locks or monkey wrench. Your passenger side tierod needs to be adjusted so it's longer. Make sure you have quite few threads inside the tierod to maintain strength. Last edited by mkparker; September 25th, 2009 at 05:22 PM. cool, thanks man. its already dark here so i'll get it taken care of first thing in the morning. its too bad i didnt know you or this site when i lived in mckinney. Yeah man, you were close! Try doin' some adjusting on yours and let us know that goes. all good brothas...it turned out that tie rod was slightly bent right before it connected to the steering box, that fixed half the prob, the rest i adjusted and its all bueno now, drives 10 times better, no more skittering around corners at only 5 miles per hour, it brakes nice and smooth, plus i wont be killing my tires now. thanks for the help again guys. Hey, I just remembered that if you unbolted the control arms from the steering knuckle you may have rotated the camber adjustment eccentric on the upper control arm. That can make a big difference if it put the top of the tire out. Glad to hear you have it working for you. it was 100% the passenger tie rod, i stepped on it and bent it back straight were i guess i curved it taking it apart, then gave it about 6 turns and it pushed the wheel perfectly inline. i measured everything twice to make sure and tightened it all back up. quick and easy like it should be, glad i have this place for all my random questions and dumbass mistakes.